With Australia's recycling industry in crisis following China's recent ban on waste imports, drastic action is needed to stop our recyclables ending up in landfill or being incinerated. But why were we sending our junk overseas for someone else to deal with? Of course, the best solution would be an end to single-use plastic. This would dramatically reduce the mountain of plastic that councils have to collect and transport to various destinations. China's waste import ban may be the shock Australians need to start being innovative and coming up with ways to do without single-use plastic. At the very least, we need to recycle or reprocess the millions of tonnes of kerbside recycling collected from Australian households each year. In WA, engineer Darren Lomman has formed GreenBatch to build Western Australia's first waste plastic reprocessing facility. The social enterprise is developing a closed loop system where it collects plastic bottles from 50 pilot schools and convert the plastic into filament for the schools to use in their 3D printers. Darren stumbled into the global plastic crisis one night when he heard the startling statement that by 2050 there will be more plastic in our oceans than fish. He nearly dismissed it as fake news. "I don't remember a world without a recycling bin at home," he says. "And you go down to the local beaches and they're not full of plastic, the streets are pretty clean. I thought we must have a really good recycling system." However, his research was not able to uncover where all that collected plastic was going. "So I actually got in my car and I drove to one of the places where the yellow bin recycling goes," he says. He met with the CEO and toured the recycling centre but didn't get many answers. "He basically said there is no reprocessing in WA." Darren discovered that plastic is sold onto the international waste market and just 1-2 per cent actually gets reprocessed into new products. The rest ends up in landfills, oceans or waste incinerators. Darren set about launching a reprocessing plant that values polyethylene terephthalate (PET) as a resource rather than seeing it as waste that needs to be disposed of or burnt. "The actual process of capturing plastic and removing labels, cleaning it and shredding it already exists," he says. "We don't need to reinvent the wheel; it's being done in other places around the world." Little balls of PET are placed into a machine that extrudes them to make filament, which the material that 3D printers use to produce solid objects such as tools, toys and even prosthetic limbs. Roughly 22 PET bottles go into producing a 750-gram spool of printer filament. Think of all bottles that could be saved from landfill or the incinerator if institutions and individuals with 3D printers were to use reprocessed filament as a priority over newly made plastic! "There are a couple of mobs around the world that have played around with this," Darren says. "It's definitely technically possible. "We literally just pull the two halves of the equation and put them together and just start doing it. "The principles been around for decades, just no one's bothered doing it in WA – or really in Australia full stop." Darren says WA's introduction of a container deposit scheme will assist the project to become viable because it puts a value on waste plastic. This generates money to cover the cost of collecting plastic from schools and running the factory. 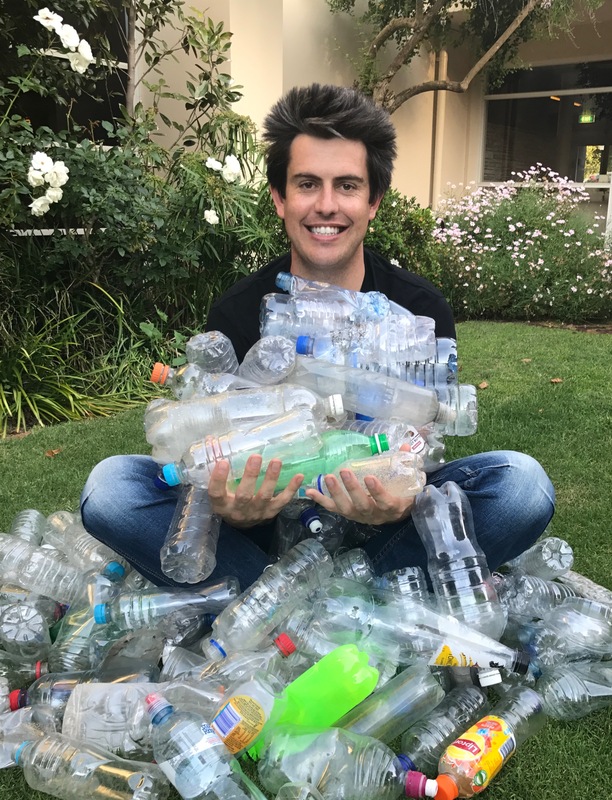 "We're getting the kids to collect those bottles and then basically donating their bottles to the school and then we pick up those bottles," Darren says. The more bottles they collect, the more filament their school earns. "They can actually print stuff at their school out of bottles that they have collected themselves. And it's all underwritten by the container deposit scheme." GreenBatch secured a $15,000 ING Dreamstarter grant, which kick-started its crowd-funding efforts. "That initial momentum to get a crowd-funding program happening is often quite hard so ING putting up that first $15,000 just gave us a boost at the start, which was phenomenal," Darren says. More than $55,000 poured in "from people who basically just believed that we can do better than sending our waste plastic offshore". Supporters can buy GreenBatch merchandise including T-shirts made from recycled plastic bottles and swimwear vouchers for OceanZen, an Australian company that creates bikinis from Italian fabric consisting of recycled fishing nets and plastic bottles. "All the things we're selling are all directly tied to plastic," Darren says. GreenBatch is receiving guidance from a corporate advisory board, while WorleyParsons is providing pro bono engineering around plant design. The University of Western Australia has offered space, and the team is working with a utility provider to source clean energy. Volunteers are helping with crowd funding, media, marketing and the website. "People like it when you come to them with a solution not just a problem," Darren says. Darren estimates that it will take 12 months to set up the facility. Twelve machines are required to sort and clean bottles, remove labels, and produce filament. "It's not a magic overnight solution," he says. "The schools know they are coming on board to support a brand new initiative and we're doing it in partnership and figuring out how to make this happen together."